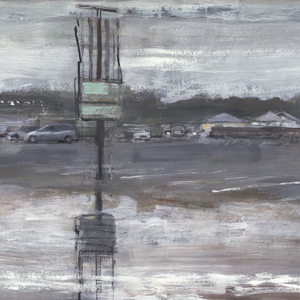 For years, my work has drawn from everyday scenes in our urban landscape. Extraordinary qualities strike me, driving by ordinary places: strip malls, oil change joints, parking lots, anonymous subdivisions. The works are about a tangible experience of light and space, and order, and painting, situated somewhere between abstraction and representation. The paintings draw on various artists, American life, desolation and unreasoning hope for the future. And Frank Lloyd Wright.